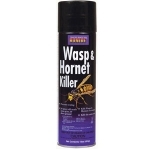 Bonide Wasp & Hornet Killer Spray provides instant knock down, quick-kill and residual action that takes out an entire nest and prevents re-nesting. Oil based, this aerosol will not release any CFCs into the air and sprays 20 feet so you can stand at a distance! Non-conductive up to 47,300 volts. Blended corn and rattan fiber; full shoulder; 3-sew; wire banded. With 1 1/8 inch clear lacquered handle. Black blended corn and rattan fiber; full shoulder; 4-sew, wire banded. With 1 1/8 inch black lacquered handle. 100 percent select corn; 2-sew, wire wound. Features plated cap with hanging ring. 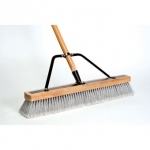 Hair-like follicles trap and hold dust; water resistant and long lasting; 1-1/8in diameter lacquered hardwood handle; 14in sweeping surface; 4 sew; metal band. 100 percent select corn; full shoulder, 5-sew. With 7/8 inch gold lacquered handle. Black blended corn; full shoulder, 5-sew. With 15/16 inch black lacquered handle. 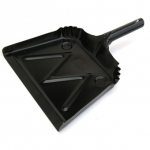 Driveway applicator with 18in squeegee, palmyra 2in trim and 48in Threaded handle. Heavy 20 gauge steel; 12in x 7-1/2in x 2-1/2in; 1-piece design for durability; baked on black enamel finish; hanger hole. 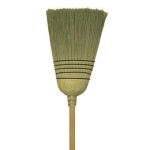 Heavy duty 24in contractor sweep broom with fine, gray flg synthetic 3in trim. Comes fully assembled with 1-1/8in x 60in wood handle and steel bolt brace and outrigger brace. 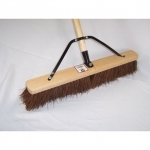 Heavy duty 24in contractor sweep broom with heavy duty palmyra 4in trim. 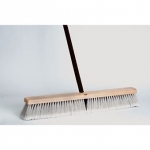 comes fully assembled with 1-1/8in x 60in wood handle and steel bolt and outrigger brace. 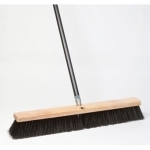 Heavy duty 24in contractor sweep broom with heavy duty all purpose black poly, flagged casing, 3in trim. 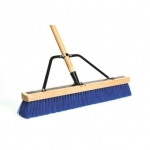 comes fully assembled with 1-1/8in x 60in wood handle and steel bolt and outrigger brace. 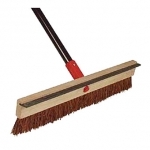 24in floor sweep gray flagged synthetic 3in trim with 60in die cast tip with steel threaded handle. 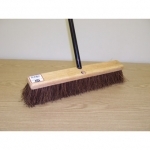 24in floor sweep black poly with 3in trim and 60in die cast tip with steel threaded handle. 18in floor sweep black poly center, grey flagged synthetic border with 3in trim and 60in die cast tip with steel threaded handle. 24in floor sweep black poly center, grey flagged synthetic border with 3in trim and 60in die cast tip with steel threaded handle. 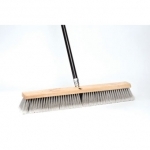 18in garage sweep palmyra with 4in trim and 60in steel threaded handle with die cast tip. 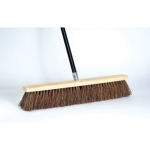 24in garage sweep palmyra with 4in trim and 60in steel threaded handle with die cast tip. Generous 21-Qt capacity accommodates 7 QT jars. 18/10 Stainless Steel for superior strength and durability to last through generations of canning. Unlike competition, will not react with high acid foods. These regular lids from Ball come in a box of 12 each with that same great quality you&#39;ve grown to trust over the years. Our screw-on plastic caps turn regular mouth Mason jars into practical storage containers. Each box includes 8 dishwasher-safe plastic caps. Our screw-on plastic caps turn wide mouth Mason jars into practical storage containers. Each box includes 8 dishwasher-safe plastic caps.